I don’t know much about Figure Skating. If judging were up to me, athletes would all be graded on song selection (the girl who skated to the Pirates of the Caribbean theme last night would have won) and number of smiles. It is really a good thing I am not a judge! Still, I’m tuned in enough to generally understand what’s going on. I can see the moves. I get that there’s a yin and yang balance between grace and innovation; can spot the difference between a skater executing his program with consistency and one looking to “raise the game.” I know an American from a Russian program. On the ice, I can tell Evan Lysacek and Evgeni Plushenko apart. But off the ice is so much easier, because one of them is dark-haired and modest and the other one is TOTALLY CRAZY. Platinum? I thought they only handed out platinum medals at the Narnia Olympics!? Plushenko’s agents have since pulled the image from the skater’s official website and denied his involvement in its creation, but we at Lifting Fog know the truth: blasted on potato wodka, Plushenko and his entourage (what’s “Turtle” in Russian?) hopped on Photoshop and went to town. 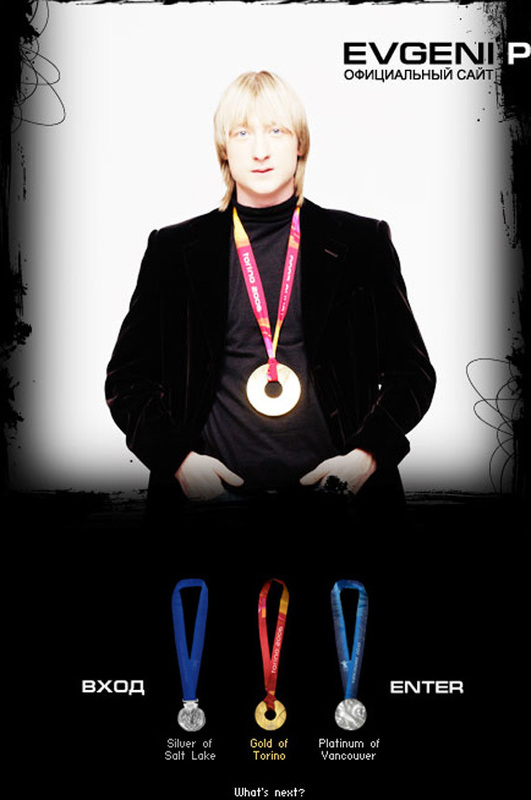 Delusion…fake awards…blonde mullets — welcome to the Lifting Fog Hall of Heroes, Evgeni Plushenko. Za vashe zdorovye! This entry was posted on February 25, 2010 at 4:00 am and is filed under "Sports", Absurd But True. You can follow any responses to this entry through the RSS 2.0 feed. You can leave a response, or trackback from your own site.